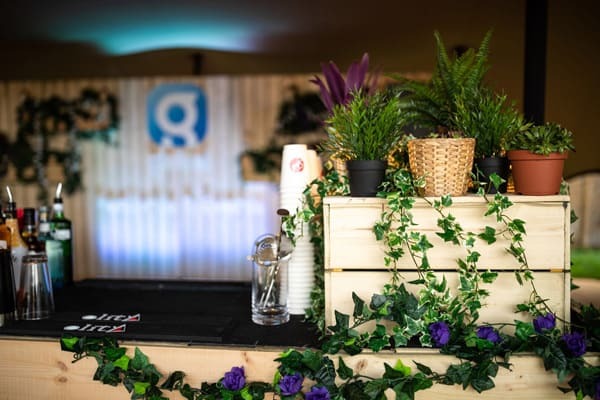 We utilised our furniture collection and hire assets to create a VIP area for Global at this year’s Field Day Festival in Lambeth. The main focus of the area was our large lightwood bar, which we paired with a feature wall to create functional service and back of house areas. The wall is perfect for attaching logos or slogans so is an easy way to brand this bar. We created a branded entrance point to the VIP area by using our wooden truss arch and dressing it with ivy and flowers. The area was then separated from the rest of the event with our wooden fencing and rustic rope and post. To complete the look and feel, we attached our festoon lighting and created a chill-out area with our rustic furniture collection which includes benches, coffee & poseur tables and tolix stools. If you’d like more information on our hire catalogue call 01242 806 778.